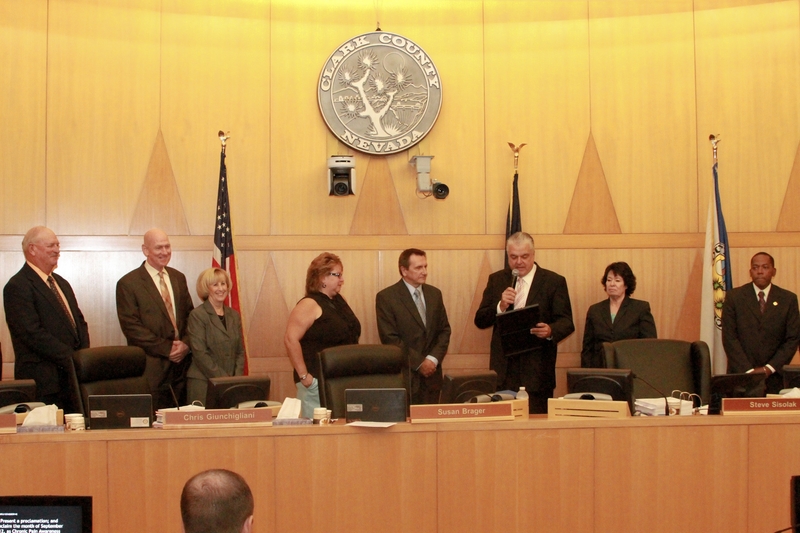 LAS VEGAS – Dr. Gary Karl, osteopathic physician and surgeon at the Pain Institute of Nevada, received a proclamation from the Clark County Commission on Tuesday, Sept. 4, during the meeting at the Clark County Government Center in downtown Las Vegas in honor of September’s National Pain Awareness Month. During the meeting, commissioners recognized the importance of awareness of chronic pain for patients locally and across the country. Between 50 and 75 million Americans are treated for pain every year – more than diabetes, heart disease and cancer treatments combined. Forty-two percent of pain patients are unable to work while 63 percent cannot engage in their routine activities. Back pain is the leading cause of disability for patients younger than age 45 (headache, neck pain and facial pain follow). For these treatments, patients spend more than $2 billion annually on prescription pain medications, and pain costs $560 to $635 billion a year due to medical costs and loss of work. Karl suggests patients find a physician who is willing to create a pain relief plan and follow it. A plan not only helps the patient see the path in front of them, it helps the insurance companies understand which medications are needed and when. Although manipulation and physical therapy work for some patients, medications are required for many cases. Dr. Gary Karl has dedicated his life to osteopathic medicine since 1979 with beginnings in Chicago for 23 years before moving to Las Vegas. His is board certified in family medicine and osteopathic manipulative treatment, and he serves as the clinical faculty supervisor at Touro University Medical School, teaching students osteopathic principles and procedures in an office setting. He published the book “Dynamics of Back Pain: Helpful Hints to Becoming Pain-Free” in 2008.